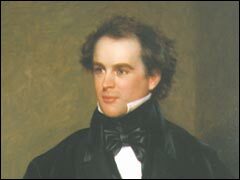 Like many of Hawthorne’s stories, "The Birth-mark" illustrates the author’s idea that artistic or intellectual passion can separate an individual from common humanity and cause him, in the pursuit of the ideal, to lose touch with any regard for the flawed, but life sustaining real world by which he is surrounded. "The Birth-mark" is the tale of a marriage tragically and ironically flawed by the idea of perfection. By the time the scientist Aylmer takes the beautiful Georgiana for a bride, his heart has already been so tainted by his intellectual pursuits that the love he feels for her is inextricably intertwined with his devotion to science. Consequently, from the outset, however strong his affection for her might be, Georgiana cannot be for him simply a close and joyful companion of his heart, but also always something apart, an object of intellectual speculation, a problem to be solved. The birthmark that gives the tale its title is a tiny crimson hand on Georgiana’s left cheek, something she has considered a "charm" until Aylmer admits to her that he finds it shocking, "the visible mark of earthly imperfection." Angry and hurt, Georgiana feels he cannot love what shocks him and together they decide that the best course is for Aylmer to use his tremendous scientific prowess to remove the birthmark, thereby repairing Nature’s flaws and making Georgiana perfect. Toward this end and to make his wife as comfortable as possible, Aylmer remodels rooms adjacent to his laboratory. As claustrophobic as they are elegant, these rooms serve as a place of confinement for Georgiana during the period of time that Aylmer studies and experiments in the next apartment, aided by his Caliban-like assistant, Aminadab. (Whether it is a coincidence that this servant’s name spelled backwards read "Bad anima" is a question left to interpretation, as is the significance of such an oddity.) Unbeknownst to Georgiana, Aylmer is experimenting upon her during the greater part of her confinement and is learning that the birthmark is no superficial blemish, but rather has, as he says to her in a rare moment of honesty, "clutched its grasp into your being, with a strength of which I had no previous conception." He explains that he has one last possible remedy, but that it is fraught with danger and she, made miserable by his revulsion at her imperfection, nobly agrees to drink whatever potion he may concoct regardless of the risk. In the end, he does effect a "cure." The final treatment works; the birthmark disappears, but in ridding Georgiana of the offensive blemish, he also rids her of her life. The hand, we’re told near the story’s conclusion, was the "bond by which an angelic spirit kept itself in union with a mortal frame," suggesting that to live is to be flawed and conversely that perfection can only be achieved in death. Georgiana’s beauty is complete, but her life has fled. It is as if Aylmer were the opposite of Pygmalion, a figure the story cites, in that his intellect turns the living woman into a statue whereas Pygmalion’s love brings the statue to life.